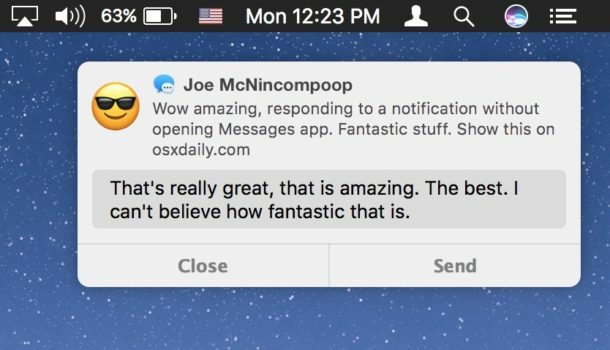 Mac users can respond to Messages faster than ever by replying directly from a message notification, without ever having to open the Messages app. 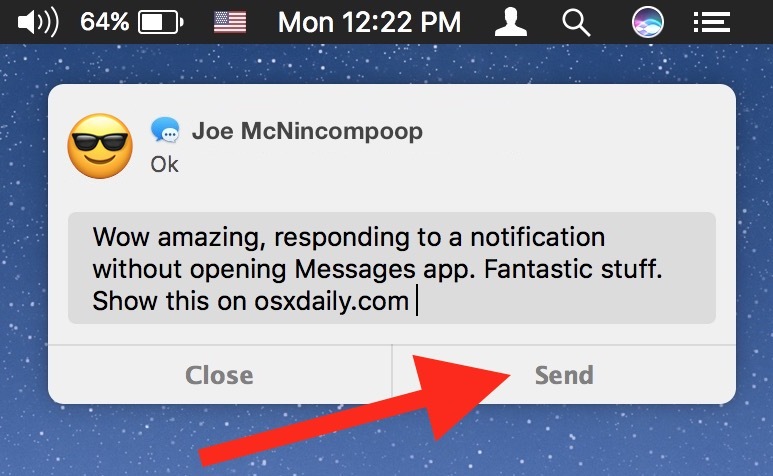 This effectively means that you can have an entire conversation through the message pop-ups in Mac OS without using the Messages app, though keep in mind the experience will be limited for multimedia messages of pictures and video, leaving this tip best for replying to normal text based communications. You’ll need a modern version of Mac OS and to have Messages app configured for sending and receiving communications either through iMessage or another compatible messaging service to have this feature. Remember you will need a modern version of Mac OS system software to have this ability, anything beyond Sierra 10.12.0 should be satisfactory. Earlier versions of Mac OS have a similar but slightly more limited ability that allows users to send messages directly within Notification Center on the Mac, a feature which also persists in modern Mac OS versions. A similar rapid-response ability is available on the iPhone and iPad, one which allows users to reply directly from a notification in iOS, and another which lets you reply to messages from the iOS lock screen, without even entering a passcode. It uses Apple’s default keyboard, so you can’t reply using GBoard, Swift, or other third party keyboards.